Posted on April 22, 2013 by Patricia Tilton •	This entry was posted in Attention Deficit Disorder, Children's Book Review, Jonathan Chesner and tagged Abilities, ADHD, Special Brains. Bookmark the permalink. How cool. What a brilliant idea to incorporate lots of illustrations and icons even though this is for teens and older. This sounds like such a welcome, positive and creative book on ADHD. Great find, Pat! Thanks Joanna. I was very excited about sharing this book. It is so funny! And, the video gives you a sense of Chesner and his book. I shared it with a friend who is a child psychiatrist and treats a lot of kids with ADHD and she was in stitches. She’s ordered copies to give to some of her clients. Kids with ADHD will realize that they have special brains and find the book a companion. Niamh, this is very special book written by a very special young man. And, it’s going to help a lot of young people with ADHD. It is brilliant! Very necessary book. I would imagine an ADHD kid reading it will feel a great sense of relief, and would go forward with a new outlook on the future. Great choice, Pat. Thanks Genevieve! This really is an outstanding book! I am so excited to share it and get the word out about the book. It is such a tremendous resource for teens and young adults. I love the video! This sounds like a really great (and fun/funny) book! I want to get this one! Yes, the video is cool! It gives you a sense of the book and the writer. I’m sure you know some kids with ADHD at school. Coleen, it is a much needed book for teens. I laugh every time I pick it up. Chesner is an inspiration for kids with ADHD. Instead of pills, doctors should be handing out this book! I used to work with ADD and ADHD kids and they were amazing. So creative and talented and so much fun to be around. Unfortunately they were labeled odd or unmanageable by parents and teachers and had low self esteem. Wish I would have had this book to give to them. Darlene, I’m glad you liked Jonathan’s book. Since you’ve worked with kids with ADD and ADHD you know that some are very talented and creative. This book is a great example. 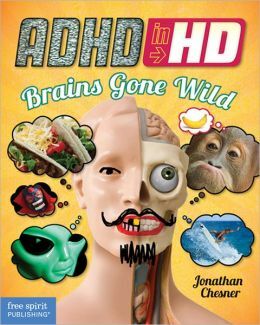 It would be great to hand every teen with ADHD with this book. It may just make a huge difference in their lives. They have special brains.